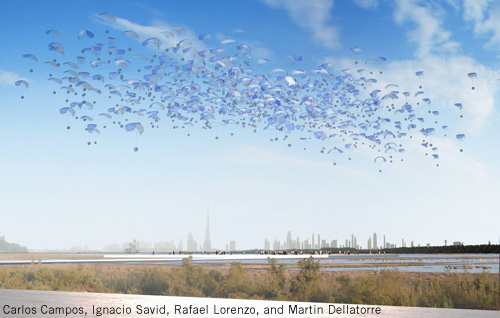 Hundreds of light spheres on the sky of Dubai. They fly in geometrical order. Suddenly, they form a line, a cloud, a sphere, a cube. They fly in organized patterns across the sky, like a flock. They reach the ground, gently. Ready for interaction with people. They go back to the sky, under a secret disposition, forming a column, dancing. One summer day, under a warm sun, close to the ground, they provide unthinked shadows, facilitating the casual promenades in the park. The installation is able to generate new, human, interactive emergencies. To take a ride under the shadow of a transparent wing, to enjoy new urban and natural perspectives, to be fascinated in front of hipnotic conformations. During the daytime, the wings collect solar energy, while producing refreshing shadow. At night, they illuminate the park, with the glow of stars, or they rise up to the sky, creating a new constellation. Light and Wings Work as an actual Icon, as a point of referente, as a new attractor for the inhabitant of the city. The flying devices, or Wings, derived from Paraglider technology, are self-controllable. They capture the energy they need using the solar cells on the top of them, and store part of this energy in the spheres, to be finally at night, to illuminate the park. On the northen area of the park, close to the water, there will be a special device to receive the ¨tired¨wings, once the wind is gone. There, they will wait untill the next flight. Wings will be provided of a GPS flight navigator, wind sensors, LED illumination devices, a solar energy panel, and accumulators of electric energy. Each wing is an autonomous artifact, nevertheless its behavior is interactive. The wings will regulate the distances they have to keep among themselves, the speed during the flight, the angle against the wind, altitude, etc. The Hipnotic dispositions, as actual dynamic coreographies, will be Developed according to interactive flying patterns. These patterns will depend on the weather conditions, a random contidion, and an interactive condition between wings, and a human interaction condition as well. 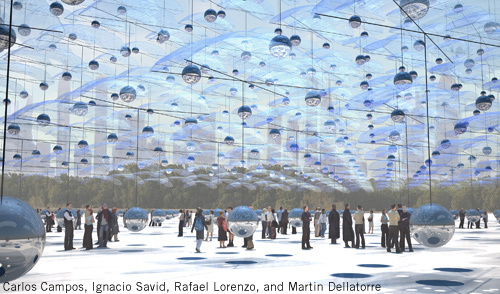 If a pedestrian, or a group of visitors enters the park, the installation will ¨notice¨ it. Information about how many visitors are in the park will also regulate the flying patterns, proximity and interaction with people. While the park is empty, our installation will move up, taking the shape of a skyscraper or a cloud, ready to be seen from the city.